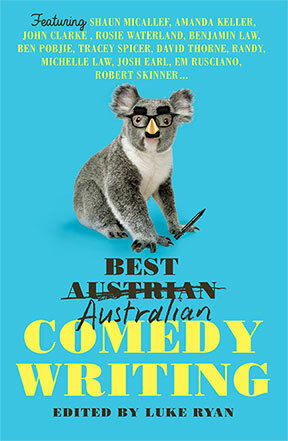 Editor and comedian Luke Ryan has searched the nation for the best comedy writing – collecting gems that have been published far and wide, and mining new comedy gold from our funniest writers. 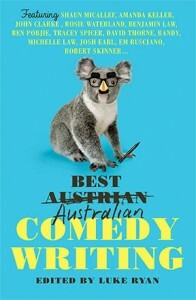 Featuring memoir, satire, fiction, scripts, sketches, prose and much more from comedy legends and rising stars, this is Best Australian Comedy Writing. Contributors include David Burton, John Clarke, Josh Earl, Greg Fleet, Anna Heyward, Ben Jenkins, Amanda Keller, Julie Koh, Benjamin Law, Michelle Law, Ben McLeay, Shaun Micallef, Ben Pobjie, Randy, Jordan Raskopoulos, Sarina Rowell, Em Rusciano, Robert Skinner, Tracey Spicer, Angela Thompson, David Thorne, Jack Vening, Lorelei Vashti, Chloe Walker, Rosie Waterland and Evan Williams.